The smartphone has too many shortcomings and users are better off waiting until Apple releases the next generation model later this year, according to the venerable consumer magazine. Consumer Reports is advising people to hold off buying the iPhone 4 from Verizon Wireless next month, saying the device they'll be getting is a middle-aged smartphone that Apple will likely replace in the summer with a new generation. The well-respected nonprofit magazine says that in the die-young world of smartphones, the iPhone 4 is already less than the cutting edge. Examples cited include its inability to run on fourth-generation data networks, including Verizon's; and its 3.5-inch screen in an era where a number of smartphones are shipping with 4-inch-plus displays. Verizon announced this week that it would offer the iPhone 4 to existing customers Feb. 3 and to new customers a week later. That's only a few months before Apple typically releases the next generation of the smartphone, usually in June or July. "This is a transitional phone to tide Verizon through until the summer," Consumer Reports said Tuesday in its Electronics Blog. The magazine's concerns are worth noting, because buying an iPhone at a carrier's discounted price starting at $199 requires signing a two-year service contract. Breaking the pact by trading in the phone early carries hefty penalties. Consumer Reports notes that Verizon's customer satisfaction ratings are much higher than AT&T's, while also pointing out shortcomings in Verizon's network. Verizon's CDMA network doesn't allow someone to make a phone call while accessing the Web at the same time. In addition, AT&T's GSM phones can roam with relative ease in much of the world, while CDMA phones can't. Good for Consumer Reports for sticking to their guns. Verizon is keen to reap the windfall of penalty fees when people who get the iPhone 4 now because they can't wait try to trade in for the 5 later this year. My bet is Verizon will get the 5 later than AT&T will. These fees are basically free money, right? Unless they have to somehow return the phones to Apple. Consumer Reports is right, with one caveat: Every month with the new technology counts, especially for people like my bandmate who have had old-school phones forever. This is because gaining proficiency with the apps available is simply too important to delay. Even if the 4 is a bit obsolete, it's still GOOD ENOUGH for millions of users. They just should skip the 5, live with the 4. The NFC stuff that'll be in the 5 will be absolutely perfect in the 6, and that's where I think all will converge. As for Android... Google has to make Checkout work, immediately, or else lose this coming NFC battle. Also, they MUST make developers happy with a giant fix for Marketplace, banner-ad-blockers, piracy etc. Marketplace mostly. If Android Marketplace could attract a curation community like Wikipedia, and Google built a more robust App Store than Apple, they'd have a chance. I think Google should buy Chomp and get those developers to build them an Android App Store the right way. This would be an excellent acquisition for them. Antennagate was an exaggerated problem in the first place. If it were genuinely a serious issue, the iPhone 4 would never have been a success considering the sensationalist press coverage the "problem" received. Nevertheless, compared with the AT&T iphone, fewer people seem to be reporting reception problems with the Verizon iPhone. This is probably due to Verizon's superior coverage. No one knows for sure when the next iPhone will be available for Verizon (certainly not Consumer Reports). There is no guarantee that waiting until mid-year in the hope of an iPhone 5 is a wise idea. I got an iPhone4 and I do have the antenna problem. I deal with having a bumper on my phone but I do not prefer it that way. I would rather use my phone without it. During the whole antennagate time I contacted Apple several times and asked for a replacement phone but got turned down because of the whole "free bumber" thing. That was a disappointing thing to hear because I do like the phone. My next phone will definitely not be an Apple phone because I feel they do not care about me, the customer. I personally don't mind using a case. I think it is only prudent to protect a fragile device with a replacement cost of $600. But to each his own. AT&T coverage is what it is. A case is necessary in order to exploit every last ounce of signal. I'm not sure what you expected Apple to do. They gave you a free case, and would have accepted the return of phone for a full refund. Apparently you like the phone enough to tolerate the indignity of using a bumper. I'll be curious to hear what your experience will be using your non-Apple phone. If you think Apple doesn't care about you, just wait until you find out first-hand why the others rate lower in customer satisfaction. Hey Brett, if Apple would give him a full refund, why NOT do a replacement? Especially if his phone is (according to them) fine. A replacement would keep him as a happy customer but a refund would lose him. A child could figure that out. Resell it to another person with a bumper if it's "functional". Make the customer happy. It's not a difficult concept. A co-worker of mine switched from iPhone to a Droid2 (I think) and he loves it. He primarily like the multitasking ability. It's a sad fact of life-- Some people live in areas not well served by AT&T. 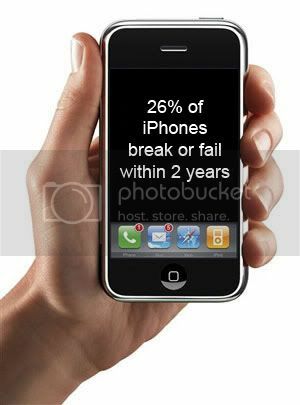 The iPhone4 may not be the best phone for these people, especially if they are unwilling to use a case. Replacement of the phone wouldn't have made a difference. I suppose that the guy could have returned his "defective" phone for a full refund while the offer was good, and then turned around and bought a new iPhone. But I'll bet he didn't bother because even he probably knew that the replacement phone would still need a bumper! For every Apple horror story your hear about someone being pissed off at Apple for poor customer service, there are dozens of customers who are very happy and a few where Apple goes above and beyond the call of duty. That's why overall Apple gets such high ratings overall. Having to use a free case on one's phone is pretty mild in the scheme of things. Thanks Anonymous. What would the harm have been for Apple to simply replace the phone? They said that the number of effected phones was low so, odds are, I could have gotten a phone without the defect. Is it too much to ask for a phone without a design flaw? No, it's not. There is no good reason for their decision besides they don't care. It's not that a certain number of iPhone 4s have something exceptional wrong with them. *ALL* AT&T iPhone 4's use the same split external antenna design with the same sensitivity issue. Apple has admitted that problems can occur for people who hold their phone in their bare hands a certain way while in an area of low reception. This is a relatively small number of people. Unfortunately you are one of them. A replacement iPhone 4 can't fix your problem. The money back guarantee and free case program were Apple's attempt to address the issue. AT&T has been trying to improve their network as well. Despite the haters gleeful trumpeting of iPhone 4's "Antennagate", Apple has yet again Topped J.D. Power Rankings of Smartphone Consumer Satisfaction. This supports my contention that the problem was way overblown and affected relatively few users.